This Left-Bank French film starring Corinne Marchand, follows a young singer in a real time as she waits to get back the results which will prove if she has cancer or not. The film has a unique color opening where the superstitious Cleo has her future foretold. The rest of the film follows her as she anxiously waits on her results. To pass the time she buys a new hat, rides in a taxi through Paris with her housekeeper, and also goes to a café. Returning to her flat, we see how privileged and spoiled Cleo is, first being visited by her busy boyfriend and then her joking composters. However, all the while she is constantly being reminded of what she is waiting for and what her fate might be. Cleo then meets with a friend who models and they drive through Paris together. Finally, she ends up at a park and in a quiet spot she becomes involved with a talkative soldier on leave from Algeria. They eventually take the bus to the hospital and she frantically tires to hear her results. Then, abruptly everything is okay and Cleo or Florence as we now know her, can continue living her life in relative peace. This film has many aspects of the New Wave with its often Chic Parisian atmosphere and a camera that constantly seems to be on the move. A memorable moment includes the silent picture starring Jean Luc Godard with Anna Karina. 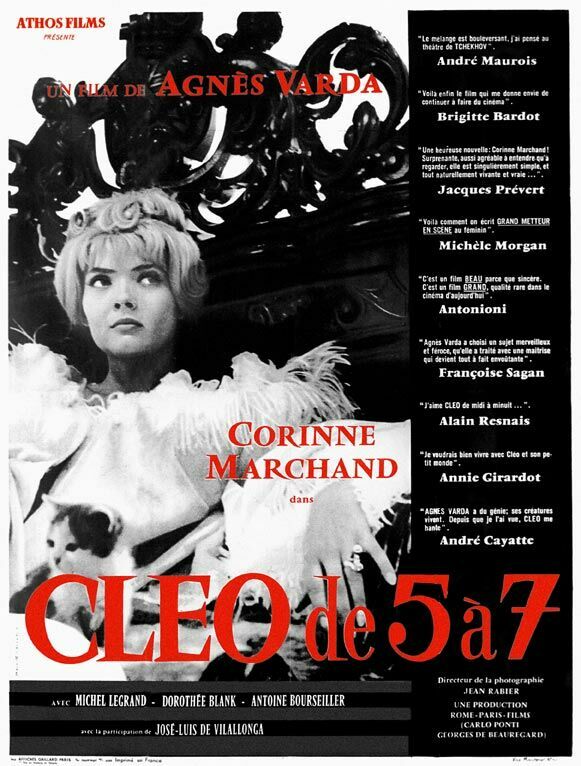 This entry was posted in 1960s, Drama, French and tagged Agnes Varda, Corinne Marchand, Foreign Film, Left Bank by 4StarFilmFan. Bookmark the permalink.